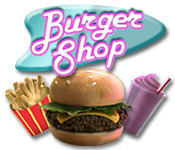 Burger Shop is rated 4.7 out of 5 by 51. Rated 5 out of 5 by Eveoflove from Warning: SUPER addictive! Review based on completed game. This "serving customers" type of TM game is just fantastic. I only started recently to get into TM games as I needed a diversion from the HOPA games. BURGER SHOP has 3 modes of play: 1) "STORY": you start with very little equipment, a small menu and patient customers; it's a good way to learn the mechanics. 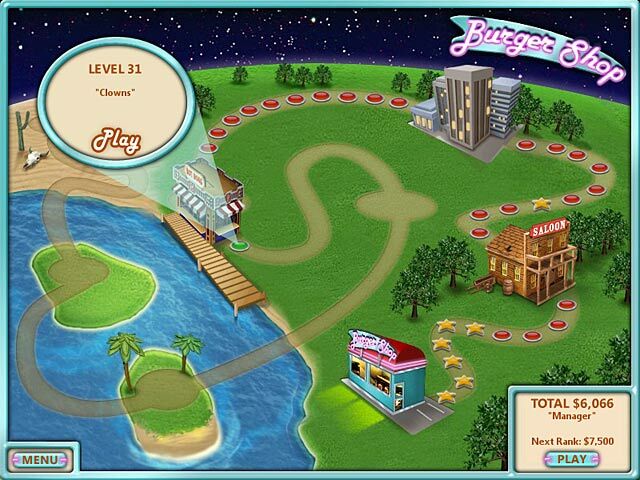 80 levels, and they get progressively more difficult as the menu becomes larger, the dishes more complicated (like a triple bacon cheeseburger with lettuce and ranch dressing) and the customer base more diverse. 2) "CHALLENGE": you can play any of the 8 restaurants from STORY mode, but in 60-second bursts; you progress to the next round and play until 1 impatient customer leaves. 3) "RELAX": don't let the name fool you... it just means that customers don't leave until being served; each round includes 20 customers, you can choose any restaurant, and there is no end in sight. A GREAT way to practice strategy. The game is easy at first... you can get all 5 stars on all levels of the first restaurant; a fair amount of clicking, but right-clicking as a shortcut to serve helps a LOT. I'm 60 and completed the game with an average rating of almost 4 stars out of 5 in STORY mode: not spectacular, but not impossible either, so don't give up; I had to replay most levels in the 8th/final restaurant 2 or 3 times to pass. As the menu expands due to "upgrades", you'll need to click certain dishes from 1 machine to another (e.g. glass of ice cream to the milkshake machine) before serving it. What's great is that you can replay any level to improve your "rating"; you can also use the "RELAX" mode to practice (but you'll need to complete 1st restaurant of STORY mode first); that will become helpful in later levels when right-clicking to quick serve is NOT the best way to serve: you'll need to click on the customer you want to serve the dish you've collected so you can maintain every customer's patience level and make sure nobody leaves. There is so much more to say, but I won't give spoilers: I had hours of fun, so I can't wait to get into BURGER SHOP 2 !!! Rated 5 out of 5 by lookingforspace from Challenging and fun This is one of my favorite games to play. Lots of variations to choose from and it can be as challenging as you wish to make it. Good for beginners and advanced players. It's a simple game to learn and as you progress you serve more complicated meals. Would love to see a new, similar game with a different menu. Rated 5 out of 5 by cinandav from Fun, funny and challenging You are in charge of a burger shop in space, and have an eclectic group of customers to serve. Game starts at easy pace, but be prepared for quite the challenge as you level up. Game offers power ups and a helpful robot to assist when things get crazy (and they will). Choose one new menu option as you level up. One of the best features is the right click option to serve customers. You also have to typical click and drag options as well. Features funny story line and entertaining characters. 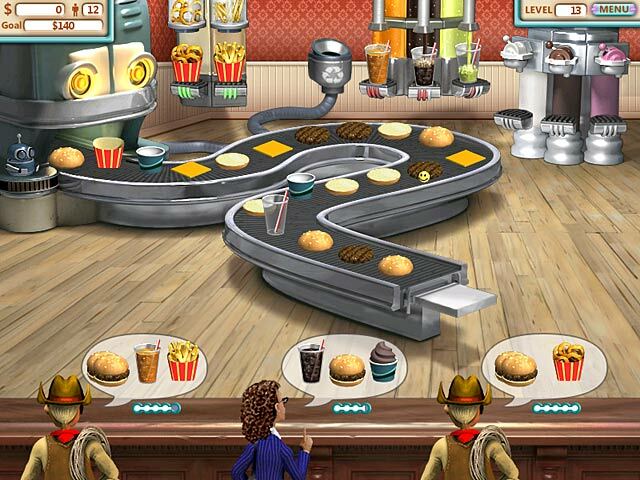 Loved this game and its sequel Burger Shop 2. Rated 5 out of 5 by AngelQueen36 from Loved it!!!! My son and I love this game. Very entertaining and addicting especially for us since we like challenging each other to see who can get the most gold trophy.